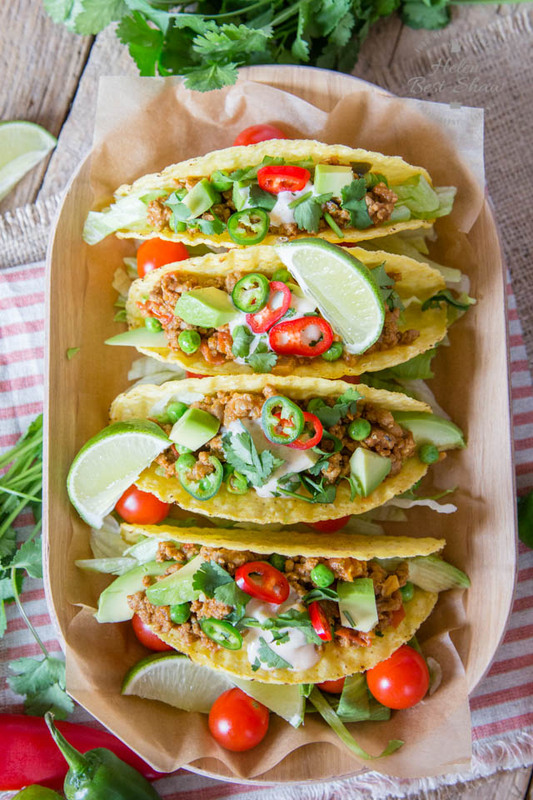 Enjoy the versatility of Indian inspired lamb keema with these fusion Indian Mexican crispy tacos. If you have never heard of, or had, keema before then you are missing out. Keema is a spicy lamb ragu – think of it as the Indian version of the Italian bolognese, but made with lamb, rather than beef and of course containing lots of lovely warming spices. The tongue in cheek Keemasutra campaign from Simply Beef and Lamb aims to encourage people to eat more lamb, and to try it in different ways spicing up their meal times with keema. 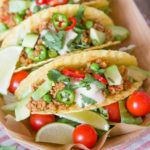 Minced lamb is both affordable and easy to cook, and by using it in familiar dishes such as these tacos, or pasta bakes, nachos and meatballs, it is an easy and exciting way to introduce it to your family. You can of course adjust the seasoning and spices to suit your family. Keema is a perfect dish to batch cook – simply make a big pan – then pack into plastic boxes to freeze for up to 3 months and defrost at a later date for a family meal. The campaign is fronted by two Keema Nans, Mamta Gupta (my friend Kavey’s mother) and Pervin Todiwala. Try them with one of these 10 Pickled Jalapeno Recipes! If you try this Lamb Keema Tacos please tag #FussFreeFlavours on Instagram or Twitter. It is amazing for me when for me when you make one of my recipes and I really do love to see them. You can also share it on my Facebook page. Please pin this recipe to Pinterest too! Thanks for reading Fuss Free Flavours! Add the lamb and stir-fry for 2-3 minutes, then add the tomatoes, sugar, tomato purée and bring to the boil. Season, reduce the heat and cook uncovered for 20-25 minutes, stirring occasionally. Add a little water, if needed. Stir in the peas and allow to cook. Use as required or cool quickly, transfer into plastic container and freeze for up to *3 months. Put the keema base (see below) in a large non-stick pan with the stock and heat for 3-4 minutes until piping hot, breaking up the mixture with a wooden spoon. Meanwhile warm the taco shells according to the packet instructions. Remove from the heat and stir through the juice from a quarter of the lime or lemon and the coriander. In a small bowl mix together the yogurt and mango chutney. 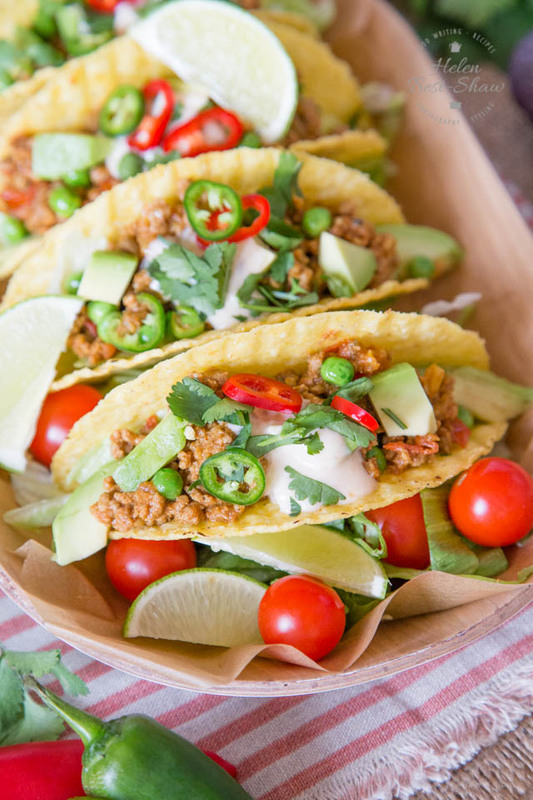 Garnish each taco base with the lettuce and top with the keema. Top with a dollop of the yogurt, garnish with the coriander and serve immediately.